This morning we rode our bicycles into Carcassonne to pick up some warm croissants and sweet white peaches for breakfast, and to shop for lunch and dinner items. After devouring our breakfast, we started up the barge and decided to continue on our way up the Canal beyond Carcassonne. Our first locks were in the center of town, where we ran through our flawless technique with an audience of plenty of curious onlookers. We cruised for a little while, until we found a good spot to moor the barge and to partake in a luncheon of charcuterie, cheese, a rustic baguette, plump purple grapes, and a delicious Minervois wine. From the beginning of our barge trip, all along the Canal we had been watching grapes being harvested, and saw large piles of grape debris created after the must was expressed from them, and we could detect the yeasty smell of the grapes being processed into wine. We spent the afternoon riding our bicycles past fields of grape vines in search of a winery that was listed in the Guide Map that we ordered when we reserved our barge. The weather was starting to change, with clouds blocking out the bright sunshine that we had been enjoying each day, but it was good bicycling weather for climbing the small hills where we found Château Auzias in Pennautier, not too far from Carcassonne. The ruby-red wines we tasted were Syndicat d’ A.O.C. 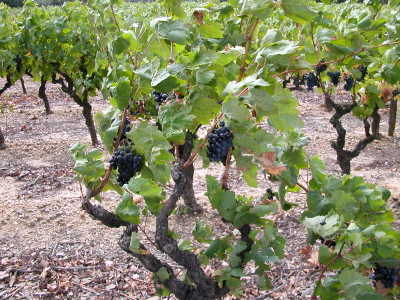 Cabardès, which requires a minimum of 40% Atlantic grape varieties (Merlot, Cabernet Sauvignon, Cabernet Franc, etc.) blended with a minimum of 40% Mediterranean grape varieties (Syrah and Grenache, etc.). Since Mike favors the Atlantic varietals, while Dave and I lean more toward the Mediterranean, all three of us enjoyed these wine, so we ended up buying a combination of 2000 Cuvée Gloria Mundi (25% Grenache Noir, 15% Syrah, 30% Merlot, 28% Cabernet, 2% Alicante), 2003 Cuvée Monsieur (25% Grenache Noir, 35% Merlot, 25% Cabernet, 5% Cinsault, 5% Alicante), and Cuvée Petits Messieurs (25% Grenache Noir, 15% Syrah, 35% Merlot, 20% Cabernet). 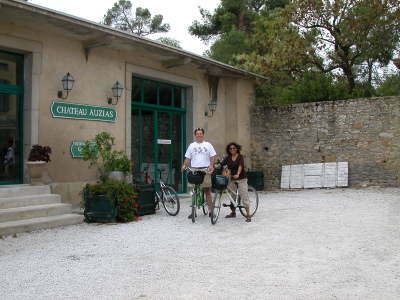 Unfortunately, we really couldn’t handle any more than just a few bottles, since only two of us had baskets on our bicycles, and I had, embarrassingly enough, already fallen off my bicycle once on the rutty lane along the Canal, on our way to the winery. Although these wines are supposed to go best with charcuterie and grilled meats, the Cuvée Petits Messieurs went perfectly with tonight’s dinner of Farfalle All’Arrabiata. 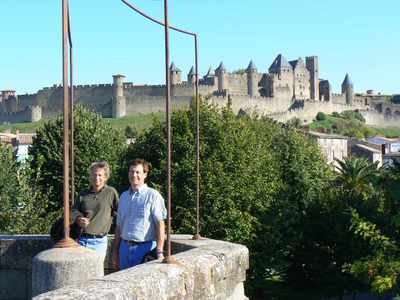 We made it to our destination of Carcassonne in the early afternoon today, and moored our barge just before the locks located in the center of town. We had plenty of time to stroll along the River Aude and into town to check out the newer part of the city, and to meander through the winding, cobbled streets of the imposing medieval fortified Cité de Carcassonne, which we had actually been able to glimpse from our barge on the Canal today. After walking, snapping photos, and peeking into the touristy little shops of the oldest walled city in Europe, lingering over drinks at one of the terrace cafés seemed to be the thing to do before our 8:00pm dinner reservation. Dinner tonight was under the grape arbor on the terrace of Restaurant Comte Roger (14, rue Saint-Louis – La Cité – 04.68.11.93.40), where, after our first course of rich foie gras, we all partook in the not-to-be-missed local specialty, Cassoulet Languedocien, the basic recipe of which must always include duck or goose confit, pork rind & pure pork sausage, and white beans. The remaining ingredients depend on whether the Cassoulet is from Castelnaudary, Carcassonne, or from Toulouse. Another essential element of Cassoulet is that it must be baked in a clay pot or baking dish in the oven at a low temperature, and the crusty film that forms on top should be broken several times before the baking is complete. Some say that it should be broken precisely seven times to guarantee a delicious Cassoulet. According to Chef Prosper Montagné, the author of “Larousse Gastronomique” in 1938 and “La Festin Occitan” in 1929, Cassoulet is the God of Occitane Cuisine. 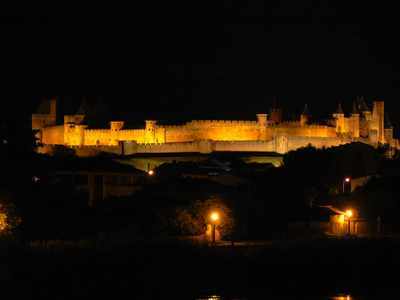 He is also quoted as saying (in French) that Cassoulet de Castelnaudary is the Father, Cassoulet de Carcassonne is the Son, and Cassoulet de Toulouse is the Holy Spirit. And, of course, to make sure that our arteries stayed good and healthy, we washed everything down with a healthy dose of red wine, a local Syrah, which was the perfect accompaniment. Each of us had chosen the Grand Marnier Soufflé for dessert, with a touch of oozing chocolate in the warm center. The ambience continued to be amazing during our after-dinner stroll in the beautifully-illuminated Cité.